The Gospels, of course, tell us very little explicitly about Mary's husband. According to Matthew 1:19, he was a "just man" – high praise in the Jewish tradition. He seems to have lived as a carpenter and craftsman (although some have said that the Aramaic word for "carpenter" can also mean "wise man"). He was not wealthy, at any rate, because he took to the Temple the two pigeons that were the offering of the poor (Luke 2:24). He was clearly a man of prayer, responsive to the will of God; and this will was revealed to him sometimes in dreams. There is a sense in which Joseph is more hidden, more silent and more obscure even than Our Lady. No Father of the Church ever preached a homily on St Joseph, and apart from in seventh-century Egypt there was no feast dedicated to him throughout the first Christian millennium. Treatises on him only begin to appear from around 1500. Thereafter, devotion to Joseph becomes more common (with St Teresa of Avila in particular). But by that time a divergence had developed between Eastern and Western Christendom. Apocryphal writings such as the Protoevangelium had presented Joseph as an old man, a widower, as the time of his marriage to Mary. The Eastern writers tended to follow this tradition, which made it easier to explain Mary's perpetual virginity. 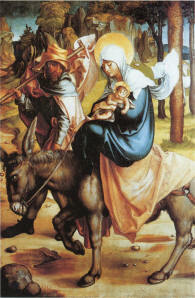 As a result, they tended to portray Joseph as a "guardian" rather than a true "husband" of Mary. In the West, however, while St Jerome and St Augustine regarded Joseph as a virgin, Augustine in addition developed a strong argument in defence of the reality of his marriage to Mary, which became the basis for the Western tradition on St Joseph. This is cited approvingly by Pope John Paul II in his important 1989 Letter, Redemptoris Custos 2. Pope John Paul points out that, although Joseph was not the physical father of Jesus, he was in Jewish terms the true legal father, and therefore no mere "foster father" or "guardian" of the Holy Child (let alone "stepfather"). Joseph's doubts in Matthew 1:19-20 revolve around this very question of whether he has the right to be his father in the sense of giving the Child his name: the Angel assures him that this is indeed his role according to God's own plan – that he must complete the formalities of his marriage to Mary and name the Child Jesus. It is through him that God wishes Jesus to experience the relationship of son to father in a Jewish family. Of course, for us to call Joseph "Father of God" (as we call Mary "Mother of God") would invite misunderstanding, and the Church has always shied away from doing so. Andrew Doze, in a splendid book about this saint (Discovering St Joseph, St Paul Publications, 1993), names him delicately the "Shadow of the Father". More than a shadow, perhaps, he is a living icon of divine Fatherhood. At what stage the child Jesus was able to make the distinction in his own (human) mind between this visible father and the invisible Father that he himself came to earth to represent, we cannot say. Certainly by the age of twelve (Luke 2:50). Perhaps he was always aware of the difference – as one who venerates an icon is aware that the image is not the reality, however well and faithfully it leads one to contemplate the sacred Archetype. This, then, is the saint whom the Church has identified as her supreme Patron and defender because he was the Protector of Jesus and Mary, and was united to them in a bond of love perfected in the image of the Holy Trinity (Redemptoris Custos, 19). God is not the God of the dead but of the living, and the saints live more intensely after death than before. Their role on earth gives just an indication of their mission in heaven. If Joseph protected the "hidden life" of his Son in the obscurity of Nazareth, even more does he protect the life of Jesus in the bosom of his family the Church. Nothing in the earthly history of Jesus is wasted, but the whole of his existence is raised up to heaven through the Resurrection. His earthly father, too, is lifted up. This justifies us in praying to him, and also in trying to understand the mystery he represents for us. I want to approach this mystery under two main "headings", if you like. The first heading is Joseph as "Protector of the Inner Life" – and thus of the Blessed Virgin who contains and nourishes that life in us. This will lead us on to some consideration of the spirituality of St Joseph. Under the second main heading I will consider in more detail the whole concept of St Joseph's "Chivalry", and how it applies in today's world. In Byzantine icons of the Nativity, Joseph is shown sitting dejectedly in a corner, looking up at an old man that tradition seems to identify with the Tempter, while the Mother of God looks down and across to her spouse with compassionate eyes. Perhaps, as some interpretations have it, Joseph is being tempted to doubt the Incarnation of God. Personally I doubt it3. I see him rather as the patron of those who must pass through the dark night of the soul, and the dry lands of feelingless prayer. No doubt he was tired and confused after the long journey, the refusal of hospitality at the Inn, the anxiety about the birth in such seemingly inauspicious circumstances. It must have seemed to him that he had already and spectacularly failed in his duty towards Mary. If he was tempted, it may have been to despair of himself, in the natural depression that comes with exhaustion. In the icons that portray Elijah the food the raven is bringing looks suspiciously like a Host, and certainly there is a Eucharistic reference here. On both occasions the miraculous food reminds us of the manna brought by angels with which God fed the rebellious sons of Israel in the desert of Sinai, and the Lectionary links this reading to a verse of Psalm 33: "Taste and see that the Lord is good." Elijah recalls the story of Moses; now in the icons of the Nativity Joseph recalls Elijah. And above him in the cleft of the rock (there is no stable in the Byzantine icon), we see the Child who is the Bread of Life. Thus as we kneel before Jesus in the Blessed Sacrament, we may imagine that the Joseph of this icon stands invisibly behind us, his hands on our shoulders, leading us in prayer. All our worries and distractions were his, too; and he has overcome them long before. The connection between Elijah and Joseph is, I think, a deep one. Elijah is traditionally regarded as the founder of that school of desert contemplation known as the Carmelite Order. St Teresa of Avila (reformer of the Carmelites and Doctor of the Church) described St Joseph as her supreme guide in the life of prayer. The long and still developing tradition of Joseph as patron and master of the interior life is described in the book by Andrew Doze already referred to. The prayers of silent faith, of simple adoration, of intercession, are Joseph's special care. As one to whom God's will is revealed in dreams of the night, Joseph can be considered the master of the life of the soul and our guide to the depths of the unconscious mind. Another great Carmelite Doctor of the Church, John of the Cross, at the end of his life when he was prior in Grenada, remarked of Joseph: "I did not understand him well enough, but that will change." Doze, who reports this comment, believes that St John had all along been expounding the spirituality of St Joseph without realizing it. It is nothing less than the spirituality of the Dark Night, which he calls the "art of entering into Joseph's home in Nazareth". It may also be called a spirituality of childhood. Scripture tells us that in Christ there is neither male nor female. But this transcendence of gender takes place not in ghostly abstraction from biology (as our technological, post-Cartesian culture would suggest) but rather through the "androgyny" of spiritual childhood, which is the foundation for a rediscovery of true masculinity as it is of true femininity. The true image of man, whether male or female, is in the Son. Joseph must learn from this Child to become a "shadow" of the Father. For the most fatherly of men is he who achieves in maturity and the fullness of his strength an ability to love commensurate with the infinite dependence of his child. For a child is little enough to be lifted up, and a father must be strong for his sake. Thus every human father learns to play the role of representing the heavenly Father to his own child, and it is in that role that he finds his mission and identity. It is also a Marian spirituality. At all times, Mary is present as intermediary for her husband, for she is the one who brings Jesus into the world and gives him to Joseph. The most Marian of saints, Joseph is the one through whom a man may come close to the Virgin, learn from her, centering himself on Jesus like her. Yet he is not passive in this relationship. Joseph is dedicated utterly to the protection of the Woman and the Child, in a chaste love that is prepared to defend the honour of his Lady to the bloody end of martyrdom. He protects her not only from Herod, but from the wagging tongues of gossip by sheltering her as his wife. Here, as I think it is St Ambrose who suggests, he is imaging the heavenly Father, for in his own supreme courtesy God would rather men doubted his own Fatherhood in relation to Jesus than the chastity of Mary. Perhaps that was all a bit too condensed! All I am really saying is that it is open for all of us to be purified of resentment, regret, fear and anxiety. In every second it is possible to be – at some level – aware of the sustaining presence and love of God. For how can we resent even a deliberate act directed against us if we are truly living in the moment, on total dependence upon the God who creates us in that moment? The Desert Fathers describe this awareness, rather than the mastery of some elaborate system of ideas – such as the Gnostic hierarchies and initiations – as "true knowledge"; a knowledge that is achieved by the pure in heart, the simple, the truly poor. "It is impossible to forgive someone else's offenses whole-heartedly without true knowledge; for this knowledge shows to every man that what befalls him belongs to himself" (St Mark the Ascetic). Christian morality is rooted in the universal call to holiness. St Joseph is a model of this life of perfection, expressed not in a formalized monastic setting or even in the literal desert but in the hurly-burly of family life. The same type of holiness may be described as a life of what the Jesuit spiritual director Jean-Pierre de Caussade terms "abandonment to divine Providence"7. For while God speaks "to all men in general by the great events in history", he speaks "to each of us individually through what happens to us moment by moment". It is not necessary to possess a theological analysis of virtue in order to be holy: in fact, the opposite is more likely to be the case. "In the same way as our thoughts and words are transmitted by air, so are God's conveyed by all we are given to do and suffer." Nothing could be simpler, or more appropriate for the relationship of God and man. Simply living each moment in the service of God and Our Lady, as St Joseph must have done, is the essence of poverty, chastity and obedience. In the rest of this talk, I want to show that Joseph's spirituality is a form of Christian chivalry. But what is "chivalry"? In Second Spring 2, Father Mark Elvins describes it as well as anyone: "the magnanimity of noble blood, deference to women, protection of the weak, refinement in manners and courage in battle". It was the ideal of chivalry that softened the harsh face of warfare in the Middle Ages. In the person of St Francis of Assisi, himself much influenced by the chivalric romances he heard from the French and Italian troubadours, this ideal became entirely spiritualized. Francis aspired to become a Knight of the Round Table in service of his Lady, Dame Poverty. Just as the bloody sacrifice of the Old Testament gave way to the bloodless sacrifice of the Mass, so gradually within Christendom the feudal service of Lord and devotion to his Lady gave way to the inner consecration of the triple religious vow, and the violence of war gave way in the saints to the violence of asceticism, by which men lay hands on the Kingdom of God. G.K. Chesterton, that most chivalrous of modern men, in his Short History of England, writes: "Chivalry might be called the baptism of Feudalism. It was an attempt to bring the justice and even the logic of the Catholic creed into a military system which already existed; to turn its discipline into an initiation and its inequalities into a hierarchy. To the comparative grace of the new period belongs, of course, that considerable cultus of the dignity of women, to which the word 'chivalry' is often narrowed, or perhaps exalted. This was a revolt against one of the worst gaps in the more polished civilization of the Saracens. The Moslems naturally suffered from the older Oriental sentiment about women; and were, of course, without the special inspiration given by the cult of the Virgin." In his study of chivalry, which is a commentary on the work of Reinhold Schneider, Hans Urs von Balthasar explains that "the collapse of the old form" – that of the ancien regime with its armies and its fortresses, its kings and barons and serfs, "has reduced chivalry to that spirit from which all form and culture are continually generated anew"9. It has been reduced, we might say, to the spirit of St Joseph, which transcends any worldly distinction of class or wealth or earthly strength, and is the spirit of obedience to God above all – the spirit of service. This is the true nobility, the nobility that culminates in that supreme kingship which stoops to wash the feet of its disciples, and which refuses to let a sword be drawn in its own defence though it could summon twelve legions of angels. It is what in this world is utterly opposed to the "bourgeois spirit" of counting the cost and judging by appearances. This kind of nobility of spirit will never die, for it is this nobility that is manifest in the dedication and integrity of priests and religious, of workers and parents, in the spirit of the Christian life. The romance of chivalry achieved its highest literary expression in the Middle Ages under the patronage of Queen Eleanor, the wife of Henry II, in the courts of Aquitaine, Provence, Normandy and England. The legendary King Arthur of Britain was set up against Charlemagne as the great model of the perfect king, in order to foster the political ambitions of Henry's new Angevin empire at the end of the twelfth century. The moral ambiguity of the tales reflected the strange, almost mystical eroticism of Provencal culture and the cult of love that was prevalent among the troubadours. Here, too, a job of Christianizing needed to be done, and the Cistercians achieved it with their Quest of the Holy Grail. The seeds were there already. It is the Queen of Heaven, not Eleanor of Aquitaine nor Guinevere, whom the medieval knight ultimately sought to serve, despite the pagan elements also present in the tradition. It was devotion to the Madonna and Child that had converted the warrior code of the converted barbarians into the medieval code of chivalry. And the Quest motif is a part of this tradition. The Cistercian version of the tale makes explicit what was already implicit in the earlier versions, that the Grail Quest is a journey within Christianity from outward observance to the inner meaning of that observance, until heaven itself can be seen by the pure of heart, within the Chalice of the Holy Blood. Von Eschenbach is another who succeeded in embodying Christian wisdom within the new vernacular literature. "The knight, as Wolfram von Eschenbach saw him [Balthasar writes], is sent into the world in order to resist injustice and to preserve justice; but he can do this only by serving that which is holy, the hidden Grail and the order that radiates out from this. Such a chivalry means responsibility, which was of course exercised under specific conditions of property by those who found their orientation here in the world and in history; but even if this kind of property no longer exists, the mission of the knight still remains: there must always be men who serve that which is holy in this world without reservation and without salary, caring for the week, the persecuted and the insulted, renewing the authority of law and fighting against injustice. The knight exists for the sake of everyone: that is his proper position in the world." It is to the Holy Grail, and what it represents, that we will now turn, for it will bring us back to Joseph. But not just to one Joseph, for there are several. Often, it seems, the names we find in Scripture are clues to their purpose and mission. Those who share a name may even share a mission, or what is said about one may illuminate the other. So it is in this case. More of that in a moment. What is the Grail? It was supposed to have been the cup of the Last Supper and the first Mass, sanctified by a few drops of the Lord's blood caught as he hung upon the Cross. (Medieval iconography often shows an angel holding the chalice to his pierced side.) It is that which contains the Holy Blood of Christ. It does not take much sense of symbolism to recognize that we are here dealing with, among other things, a symbolic image of the Blessed Virgin Mary, whose cult was reaching full maturity at this time, partly under the influence of St Bernard. It is, after all, Our Lady who is the true "Spiritual Vessel" that contains the precious Body and Blood of the Lord for nine months after the Annunciation, and spiritually thereafter. By the way, have you noticed how, the more one tries to think about the Virgin Mary, the more one finds oneself reciting a Litany? Our Lady is the incandescent Bride of the Spirit, source of the world's purity, a pillar of fire in the wilderness, "Living Symbol and Beginning of the world in the process of purification", a Burning Bush "embraced by the flame of the Holy Spirit". These last expressions are taken from the Russian writer, Pavel Florensky. "Just as the Spirit is the beauty of the Absolute," he says, "so the Mother of God is the Beauty of the Creaturely", "the glory of the world", "most beautiful flower of earth", the "Bearer of Sophia"13. And if the Grail is "really" Mary, she is in the keeping and under the protection of Joseph. The other Joseph in the Gospels who – according to tradition – has a special relationship to the chalice of the Lord's Blood is Joseph of Arimathea. Actually, in the Gospels themselves he is linked neither to the cup nor to the womb of Mary, but rather to the tomb in which the body of Jesus is laid to rest, and where the hidden work of the Resurrection is performed. But symbolically speaking the sealed tomb is, of course, also equivalent to the virginal "womb" from which Jesus is born, or in this case re-born, and several of the Church fathers have delighted in the parallel. This may help to explain why, in legend, this other St Joseph becomes the keeper of the Holy Grail, which he is said to have taken, after the Lord's Ascension, to England. Interestingly, both St Josephs are portrayed with a flowering staff, for according to the apocryphal story Mary's Joseph was chosen by this sign to be her husband, while Joseph of Arimathea planted his in the fertile ground of Glastonbury Hill, on the Isle of Avalon. Both, of course, are wise men blessed with gentleness and entrusted with the world's greatest treasure. Thus the later Joseph leads us to the feet of the earlier. I cannot resist pointing out that there is a third Joseph in Holy Scripture. This is the Patriarch Joseph, son of Jacob who was called Israel. (Mary's Joseph, by the way, was also the son of a Jacob, according to Matthew 1:16.) Several of the Church Fathers remarked on the fact that the Old Testament Joseph is portrayed as a man of dreams from his earliest days: it was his dreams that got him into trouble with his brothers, and rescued him from prison. They remarked also that he was sent by God's providence into Egypt – as was the later Joseph – to prepare a refuge for the sons of Israel. He was the keeper of the King's household, the man who administered the Pharaoh's treasuries and storehouses of grain, and shared them with the twelve tribes. (Later, in the Exodus, his bones will accompany the people to the Land of Promise alongside the Ark of the Covenant.) In the words of St Bernard, "The Patriarch saved up corn not for himself but for all the people; St Joseph received the living Bread from heaven for himself and for the whole world." There is even a chalice in the story! (See Genesis 44:2, 4, 12, 16.) Jewish legend, elaborating the story somewhat, identifies this as Joseph's silver "divining cup" – that is, the magic cup in which he can read the past and future. It is the symbol of the magical powers he has acquired in Egypt (or, we might say, of the supernatural gift he has received from God). According to Genesis, Joseph orders this chalice to be hidden in the sack of corn he has given to his youngest brother, and uses its discovery to bring about in the oldest brother a gesture of self-sacrifice leading to authentic reconciliation; that is, in order to bring about repentance for the primordial sin the brothers had committed against Joseph in their youth. Is it mere coincidence that Joseph's cup is an instrument of reconciliation, and the chalice of the Mass much more so, being consecrated with precisely these words: "This is the cup of my blood... It will be shed for you and for all so that sins may be forgiven"? Here is surely one of those subterranean secrets of type and antitype, beyond the reach of scholarship, that testify to the organic coherence of Scripture and tradition.. Does this Joseph, too, reveal something of the stature of Mary's Joseph, pointing in the providence of divine inspiration towards the one whom God entrusted with the precious Vessel containing his own Son? I will leave you with this question. My conclusion is brief. It seems to me that if we are to experience a "new springtime of faith" in the third Christian millennium, we need to rediscover our mission as Christians called to holiness, and to learn the true "Chivalry of the Gospel" from the man God sent to find and guard the Holy Grail that was his own Mother.